Just a short flight from the east coast of the US, enjoy world-class scuba diving, high end shopping and dining, and romantic pink-sand beaches, all on an island with a historic British influence. The minute you step off a plane and onto the soft shores of Bermuda, it’s quite apparent that you’re in for something extraordinary. From the perfectly pink beaches to its historic parishes filled with charming ruins and romantic B&Bs, the quaint charm of Bermuda weddings is hard to miss. Though the island seems like a continuous land mass, it is actually made up of 181 islands, islets, and rock formations. In other words, you are never far from the striking Atlantic waters, filled with more than five centuries of nautical history. Bermuda destination weddings provide excellent opportunities for scuba diving through coral-crusted shipwrecks, or perhaps you’ll want to kayak below the bluffs into sea caves to appreciate both the beauty and history of these waters. 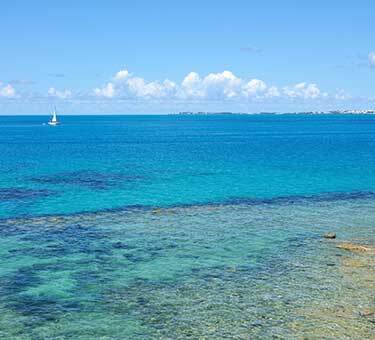 Be sure to check out our variety of Bermuda wedding packages and start planning today! If your dream celebration includes vows on the beach and a casual, yet festive reception, you are the perfect candidate for a Bermuda wedding. In town, there’s ample history and beauty to be discovered along the parishes’ cobbled streets. Bermuda’s prime and strategic location has made it a stronghold for forts and historic war sites, so British towns like St. George’s are dotted with architectural treasures —making these Bermuda wedding venues prime lookouts for dramatic and memorable photos. If you’re looking for the ultimate in luxury, head to Tucker’s Town for its rejuvenating spas and natural beauty.